Birthplace: Manchuria, China Blood Type: A Zodiac: Aries Taken from Wikipedia: Hideshi Hino is a manga artist who specializes in horror stories. His comics include Hell Baby, Hino Horrors, and Panorama of Hell. 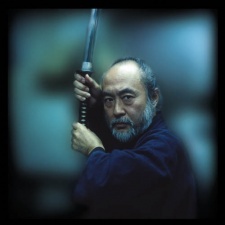 He also wrote and directed two of the Guineapig horror movies which were based on his manga: Flower of Flesh and Blood, which he also starred in, and Mermaid in a Manhole. Hideshi Hino was born in China to Japanese immigrant workers in Manchuria just when Japan surrendered at the end of Second Sino-Japanese War and the vengeful anti-Japanese movement in China was taking place. His family had no choice but to escape to Japan before being lynched by Chinese civilians, so his town gathered up everybody and started to make their move to the remaining internationally governed harbours. Hino has claimed that he was nearly killed en route to Japan by his fellow townspeople during the evacuation from China. Some of his manga have been based on his life and its events; for example his grandfather was a real life Yakuza and his father used to be a pig farmer with a spider tattoo on his back. Hino has depicted these in his manga many times (as in Panorama of Hell).